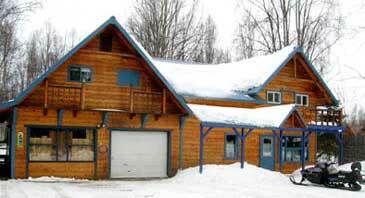 If you're traveling to Talkeetna and looking for cabins for rent, consider renting the entire lodge. The lodge can comfortably accommodate larger groups. It is ideal for families, wedding parties, and travelers looking for all of the comforts of home with the privacy of a cabin rental. 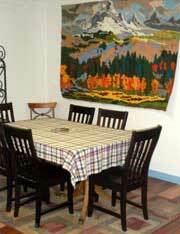 We offer centrally located lodging on quiet Second Street near beautiful downtown Talkeetna. It is easy walking distance to most of what Talkeetna has to offer including local shops, restaurants, scenic flights, river boat tours and more. Guests qualify for discounts on several tour activities, please inquire for more info. Full kitchen, stocked with dishes, cookware, etc. Bicycles available for guests, free of charge. Outdoor fire pits and covered sitting areas. Price does not include 8% tax. Reservations can be confirmed with with major credit card, check, Money Order or cash. There is a 5% borough bed tax. Check-in is usually after 3 p.m. but with prior arrangements, it can be adjusted. Check-out is by noon so that the rooms may be cleaned. Cancellations made with more than 7 days notice are subject to a 25% cancellation fee. Cancellations within 3 to 7 days of reservation date are subject to a 50% cancellation fee. Cancellations made within 72 hours of reservation are non-refundable. Pets are welcome upon pre-approval and a damage deposit of $25.00. (plus $10.00 every 3 days for your pet) Your deposit will be returned to the registered address if warranted within 3 days after check-out.